Although the line-up of 16 teams were finally announced, the exact start list of riders has not been announced. Yes the team announcement is late in 2015, but recent changes in the start list for the Vuelta a España, the doping positive of Tom Danielson, plus the general consideration of competition on this year's route, may have added to the long delay of announcing which teams (and in the end riders) will race in Colorado this year. Keep your eye on Pro Cycling Stats as the rider startlists continue to form: USA Pro Challenge rider rosters. 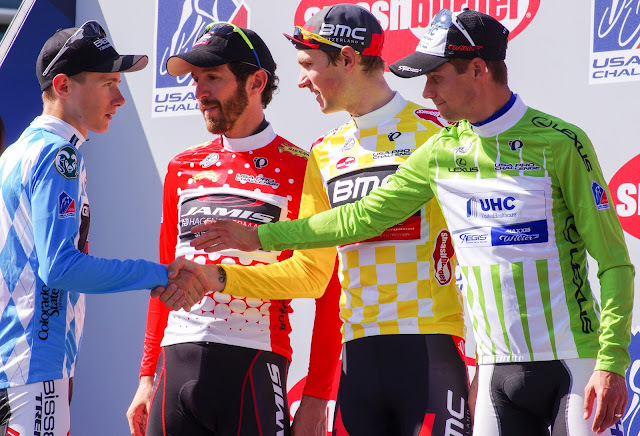 Tejay Van Garderen will not be racing in Colorado to defend his win two years in a row. Tejay will be racing at the Vuelta a España in Spain, along with Rafal Majka, a star in last year's USA Pro Challenge. Joe Dombrowski, Ben King, Andrew Talansky, Franck Schleck, Jasper Stuyven, Riccardo Zoidl, and Joey Rosskopf will also be racing the Vuelta. Tom Danielson, took 2nd place overall at the Pro Challenge in 2014, but he too will not be racing due to an announcement this week of a positive test for synthetic testosterone. If you are curious - this was the final GC standings in 2014: Who won the 2014 USA Pro Challenge? Let me add that I am quite excited to watch some of the new teams to this race: Budget Forklifts (AUS), Caja Rural-Seguros RGA (ESP), Axeon (USA), and Cycling Academy (ISR). Chris Horner and his team will not be racing in Colorado. I worried for race organizers of the USA Pro Challenge during the recent challenging few weeks. I feared the teams and rosters would not dazzle. They do not. It is not the best sign that this race could not attract a higher level of competition this year (OK, I can hear the roaring response "it's always the Conti teams who win stages at the USA Pro Challenge anyway," and right you would be!). Still, the future of a race such as this is built on sponsorship, which rubs elbows with teams to attract big names, which feeds the fire of fan interest, which brings the big press in town to broadcast the race to the world and label it as a tough competition and world class event. For the average fan, who simply wants to have a blast in the beautiful outdoors of Colorado, under blue skies and mountain breezes - they will come. For families who want to bring their kids to see the action - they will come. For locals who are thrilled to have a big event in their town - they will come. For die-hard race fans ... they might come, if beer and a rest day off the bike coincide. For top riders ... they might not be coming. For journalists ... they might not come, especially the top tier reporters. In fact my friend Kim Hull of Cycling Perspective, just sent me a message that they are changing plans and not coming to Colorado to photograph and report on the race. Darn! They are so much fun. I will be going, simply because I feel bad on backing out on local reservations. I am bringing my dog Jack to Steamboat this year for four days. He has cancer yet again and will need some extra TLC. I was thrilled the Rabbit Ears Motel welcomed both me and Jack for the long weekend preceding the two stages in Steamboat. Thank you, keep the light on, I am still coming. Remember the USA Pro Challenges had a five year business model. We are now in year five. Please come out to see the race, AND watch it on TV, so there might be a sixth year. Cheer loud for the riders I hope to see at this race: Alex Howes, Kiel Reijnen, Lachlan Norton, Phil Gaimon, Danny Summerhill, Matthew Busche, Ted King, Carter Jones, Robin Carpenter, Rohan Dennis ... and the list goes on. No official word on whether Phinney and Stetina will race in Colorado, they are busy racing in Utah this week, their BMC team has not announced its full squad for the Pro Challenge. No, I don't know if Peter Sagan is coming, he has been on a well-deserved vacation, fishing. Busche withdraws from Utah after downhill crash; "hopefully I can bounce back for Colorado," said Matthew Busche. Many of you will remember dutch cyclist, Laurens ten Dam racing in Colorado in past years, his Team Lotto NL Jumbo Cycling reports today: Laurens ten Dam got hit by a car during training. He broke a dorsal vertebra and will be moved to a Dutch hospital. Now that's not nice. VeloNew went on to quote Horner, “If they don’t want to bring the only active [American] grand tour champion, the only [American] guy to ever to win the Tour of Spain, the only grand tour winner over age 40, then that’s their call. “I can’t do anything about that. There’s always another race. I don’t need Colorado on my resume when I retire whenever. … I am a grand tour winner.” Well okay Chris. I have been compiling lots of information about the USA PRO CHALLENGE, and plan to release the individual race guides this week. Check back.